Every day I look forward to pouring myself a hot cup of coffee. Having a cute coffee mug always seems to elevate the experience! 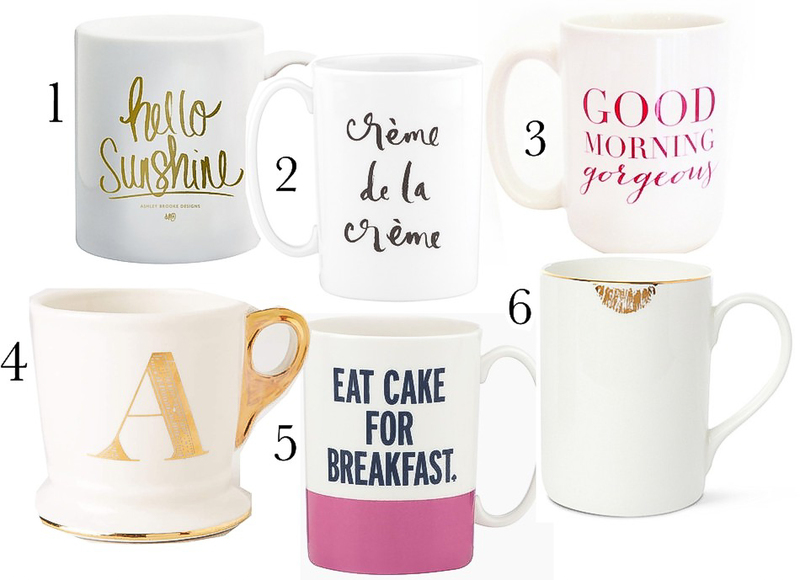 Here are 6 stylish mugs to help get your morning started off right. 1. Hello Sunshine, $23 This mug has a playful happy feel to it. Perfect to get your day started on a positive note. 2. Creme De La Creme, $20 I love french sayings on basically anything. Why not have it on my coffee mug too! 3. Good Morning Gorgeous, $28 It’s always nice to get paid a compliment, even if it’s from your coffee mug! 4. Limited Edition Golden Monogram Mug, $10 I currently have the standard monogram mug from Anthropologie and love it. I am looking forward to adding this beauty to my coffee mug arsenal! 5. Eat Cake For Breakfast, $20 Kate Spade is known for her fun, upbeat designs. This mug is perfectly girly and festive. 6. Gold Stained Mug, $31 This cheeky gold lip stained mug is just plain adorable. It brings a smile to my face every time I see it. Will any of these mugs make it into your morning coffee routine? Let us know in the comments below! Bright colors, modern design, and a splash of gold are always on the "design menu" for me. I'm always on the hunt for home décor that has an upbeat vibe that is just plain FUN! Today, I am sharing ten of my current design obsessions, enjoy! 1. Michelle Armas Print: I love abstract art especially ones from this talented artist. 2. West Elm Glasses: These beauties are perfect for displaying on my kitchen shelves. 3. Ikea White Plant Pot: Having as many plants as I do can get expensive, that's why I always stock up on these inexpensive pots from Ikea! 4. Barn Light Electric Sconces: I love these delicate wall sconces. They are ideal for hanging next to the bed or by the fireplace. 5. DENY Designs Bedding: Ombre bedding in this color has such a calming effect, it's perfect for winding down at night. 6. Bello Pop Matches: I am always lighting candles so having a stylish box of matches to leave out on my counter is a must. 7. The Fashion Book: This gem is one of my top picks for a coffee table book by far. 8. World Market Coasters: Pink agate coasters...I'm in love! 9. Ikea Sheepskin Rug: For a mere $10, these rugs are great for throwing over the back of a chair... or two...or three! 10. Jonathan Adler Phone Dock: Charging your phone at night is essential, so you might as well charge it in style. What's your design style? Let us know in the comments below! Trays are a life saver for me. They take items that look jumbled and miraculously make them look organized and pretty. Trays however can get a little pricey especially when you use them as much as I do! Thats why I love going to thrift stores to purchase them. Thrift stores are excellent for bargain hunting! All you need in order to be successful at thrifting is an open mind, patience, and a creative eye. I always look at objects and imagine them a different color. I found this tray that was totally not my style but, I knew the shape would work for my bedroom if it was painted white. I snatched it up for $1.50 and whipped out my trusty white spray paint and this is what I got... (drumroll). This turned out to be the PERFECT tray! I wanted something simple, white and girly that I could display my perfume and jewelry on. All I did was clean the tray, sand it, and spray it with 3 coats of white spray paint. It was ready to use in no time! Style, whether it's clothing or home decor is attainable on any budget. Just as we express our unique personalities through our clothing we can do it through our style at home and we don't have to go broke doing it. I find diy's at times to be more fun then going out and buying a brand new item. Re-purposing something is like putting your own individual stamp on it. What are some of YOUR favorite DIY projects? Let us know in the comments below. For more thrifted finds click here.